Roller derby is still years away from a serious bid for inclusion in the Olympic Games. But the JRDA and USARS are teaming up to take a major move toward it. In a recently-announced collaboration, the Junior Roller Derby Association will join USA Roller Sports in bringing high-level junior derby to the AAU Junior Olympic Games this year. The competition is planned to feature a selection of elite regional and international teams, and will take place in conjunction with the JRDA Championships and USARS Nationals in Lincoln, Neb. this July. The AAU and USARS had previously partnered to add the derby to the Junior Olympics, with the AAU and granting authority to USARS to oversee proceedings. Having the JRDA on board will now allow everyone to put on the best possible showcase for junior skating talent. With the partnership, USARS is deferring the bulk of the organization of the event to the JRDA, who quickly confirmed that the competition will be played under the JRDA-amended WFTDA rule set. The JRDA has also already set guidelines for team selection. To make the strongest possible squads, players from the nine JRDA regions will be combined to form five regional teams. Spots are also being reserved for select teams from Canada, Australia, and the rest of the world. The JRDA has already selected coaches for the domestic teams, who will spend the next four months scouting players to fill 20-skater charters for each of them. Players interested in becoming a Junior Olympian will need to fill out a recruitment form to alert the coaching staff. In lieu of tryouts, coaches will make their way to events that a signed-up skater would normally participate in to evaluate their skill. Team selections will be completed by May 1. 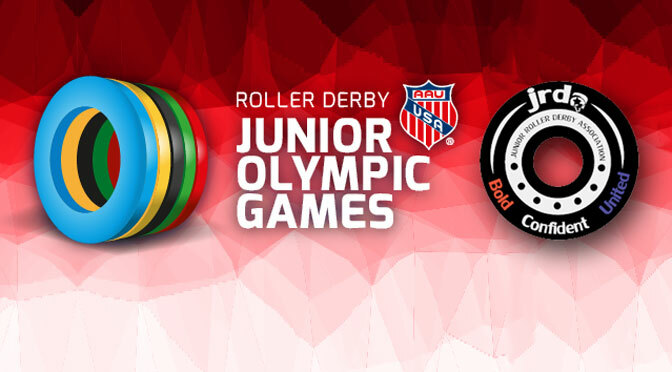 For more details on junior roller derby at the Junior Olympic Games, including registration information, FAQs, and signups for officials and announcers, visit the Junior Olympics page on the JRDA website, here. Maybe some junior skaters will be participating in all three events? Remember, high-skill juniors are allowed to skate with and against adults in USARS, too.